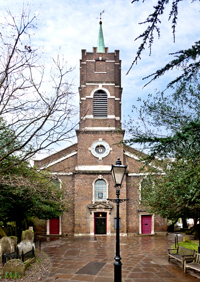 In 1986 (Hampstead's Millennium year) our church raised a 'voluntary rate' towards the appeal for redecorating the interior of our Georgian building. The response from residents within the Parish boundaries was so good and the feedback so positive that we have continued to raise this rate every year since. We do, however, only make the appeal for the benefit of the maintenance of the building. It has never been suggested that money so raised, from people of other faiths and none, should be used for the running costs of the Parish. Since the Council Tax was introduced we have based our appeal on the band of each property. For Commercial Premises, for which rateable values are now so high, we ask for one tenth of a penny for each pound of rateable value as being an acceptable amount.